Accumulation and analysis of data is the upcoming trend, which is being supported by the internet. The internet has spread its arena in a huge way and the devices, as well as objects, are connected to each other through it. The purpose of controlling the data is to know about the patterns and vogue in order to benefit the various sectors like energy conservation, lifestyle, health, and transportation. Data can only be nurtured in a fruitful manner if it is conjugated with IoT or Internet of Things, as one is incomplete without the other. The main challenge is to gather information from the devices when it is still under a particular process. However, it is important to understand the importance of Big Data as well as IoT, to understand the connection between them. IoT is a simple concept, where the common objects are converted into the smarter ones with the help of sensors and chips. The insertion of the digitized objects in the objects will be able to accumulate data from them even if it is not connected to the internet. This process will help in establishing a connection between the digital world and also among each other. IoT has been implemented to track and gather information from those objects in order to know the usage pattern and also the performance of the product. It is anticipated that by the end of this decade, IoT will be reaching in most of the objects that will help in improvising the trend and various aspects of the lives. Starting from watches to traffic signals and Smartphones to smart homes, IoT will make the data processing seamless. Hence, people will enjoy exceptional products and can live in an ambiance that is safer and smarter. With this exponential growth, the IoT devices are projected to reach more than 20.8 billion things. High-quality and sensitive data can be gathered. The process of collection and storage of data can be pre-determined. Privacy is maintained if the situation calls for it. Laws are designed to activate when the security is breached. When information is described with the help of veracity, variety, volume, and velocity, then it is termed as Big Data. Veracity is the uncertainty whereas velocity is the speed with which data is captured. Big Data is the composition of a huge amount of data that is an amalgamation of structured as well as unstructured data. The amount of data gathered can be controlled. The type and nature of data can be selected to get an effective result. Analytics and algorithms are used for processing the data. Uses inductive statistics to understand the dependencies and relationships of the data. The latest technology demands new hardware and software applications along with a new infrastructure. The firms need to take care of the flowing data in order to analyze it in real-time. This activity can be proficiently taken care of the tools of Big Data analytics. It will help analyze the mass of huge flowing data from the IoT devices. 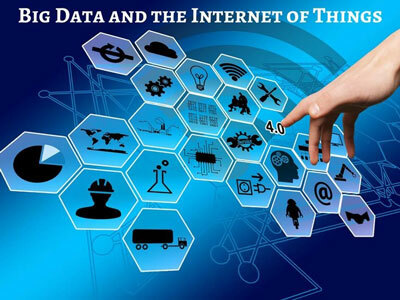 IoT and Big Data are the most important part of an industry, in which IoT is utilized to capture data from various sources, which is taken care by the Big Data analytics in order to get an insight of the information. IoT concerns the devices, connectivity, and data. The main purpose of IoT is to create smarter devices that will successfully deliver intellectual insights of those products. This helps in opening a new business prospect. With the onset of numerous smart devices, the intervention of Big Data has become mandatory. It will not only gather proper information but will also capture the data in a particular style. This enables the Big Data analytics solution to get a prompt result that leads to an accurate extraction. When a data is being extracted, the prime concern is to distinguish between the type of data, that is structured, unstructured, contextual, real-time, dark, images, etc. This is done efficiently with the help of Artificial Intelligence that helps establish a proper connection between the smart devices and digital world. The motto of the entire process is to extract valuable data from the smart devices in order to understand the operation, which will help nurture the business in a positive direction. The Big Data technologies need to be augmented to store, capture, and manage data from the continuous flowing data from the devices impregnated with IoT chips and sensors. It is clear from the aforementioned points that the IoT and Big Data are entwined with each other in order to produce greater results. The activity of Big Data will not be accomplished without IoT and vice versa. In simple words, IoT is the impression that is run with the help of Big Data. Fusion of these two aspects will help create a modern world that is smartly connected to each other. The intervention of IoT will accentuate the smarter decision-making process, making the digital world smarter and safer.